The initialize() method reads a cookie name from the configuration done in the Websphere Application Server ISC. It illustrates how you can configure a TAI externally without having to hard code it. The isTargetInterceptor() method looks at the request and sees if a cookie with the configured name is available. If yes it continues to process the request and if not it aborts processing (from the TAI point of view). The negotiateValidateandEstablishTrust() method does the actual work by simply telling WAS that the username of user is the value from the cookie. As you see writing a TAI is very simple but extremely powerful. Imagine what could be done if you did SSO between Websphere Application Server and Lotus Domino. Trust Association Interceptors (or TAI’s) for Websphere Application Server is quickly becoming my new favorite technology. They just might be best thing since sliced bread and the reason why why you want to embrace Websphere Application Server. And so quickly. I have discussed TAI’s and why they’re important in an earlier blog post. In short isTargetInterceptor is called to determine if a given request matches a given TAI and if it returns true negotiateValidateandEstablishTrust is called to determine if this TAI could authenticate the user and that the username (“Subject”) is. Very easy. It’s important to note that “authenticate” could mean whatever you decide it means. That is you could actually do some work to authenticate the request but you could just as well simply decide that the user is authenticated and that the username is “John Doe123”. Whether the authentication is done based on “real authentication”, based on a cookie being set or something else is entirely up to you. That’s why it’s so powerful. Once deemed authenticated by negotiateValidateandEstablishTrust a valid LtpaToken/LtpaToken2 is generated and the user is granted access into the Kingdom. Do you care for TAI? You really should!! Websphere Application Server is a beast. A big beast. But it’s a beast that good (even great?!) on a lot of levels and it’s definitely not as bad as you might think and it comes with a lot of goodness and loads of functionality. One of the real cool things about Websphere Application Server is the ability you have to extend the core application server (which is something that is hard – becoming easier but still hard – with Lotus Domino). The extendibility I want to mention today is Trust Association Interceptors – or TAI for short. A Trust Association Interceptor is an exciting piece of technology that has been part of Websphere Application Server for quite a while and a technology that is becoming my new best friend. It’s objective is to sit between an incoming request and the application server runtime and let you manage the authentication state of incoming requests. Think DSAPI filters to manage authentication if you will except that TAI’s are written in Java and much easier to write, test, debug and deploy. If you have a reverse proxy such as WebSEAL the way you make it work with Websphere Application server today is by installing a TAI into the application server. It’s also the way that SPNEGO support is added. As with many Java technologies you could just as well write your own – and it’s dead easy. It’s even well documented in the IBM Infocenter. So why would you want to do so? Well imagine if you’re installing IBM Connections and have an existing SSO solution you want to reuse to authentication. Writing a TAI lets you do that with a minimal hazzle. I’ll post about how you actually go ahead and write a Trust Association Interceptor later. Posted on June 8, 2011 Tags tai, was, websphere2 Comments on Do you care for TAI? You really should!! In the latter part of last year I was involved in installing IBM Connections at a customer site for initially 20.000 users and then, if all went well, for the full 70.000 users. The challenges in evangelizing the solution and getting people to use it is for another blog post but the project is interesting from other perspectives as well. Firstly they wanted to change the layout of IBM Connections and add their own colors etc. which wasn’t a biggie. Next they wanted to change certain core words within IBM Connections. In Danish the word for “Communities” is “Fællesskaber” but they wanted it to be “Grupper”. Changing that throughout IBM Connections was a hazzle and we have to migrate these changes by hand when we upgrade to version 3 but it was possible which is the good story here. The last one was the biggest requirement and the the requirement it took the most work to satisfy. They wanted to turn the entire login process for IBM Connections on its head. By default IBM Connections works by you importing all valid users into the Profiles database using TDI or a handcrafted tool and then hooking Websphere Application Server up to LDAP. They didn’t want that and the users actually didn’t exist in a LDAP directory but instead in another (Domino based) member database. IBM Connections should work with their existing single-sign-on (SSO) solution which supported a number of different login methods incl. two-factor and digital certificates. Before being granted access to IBM Connections the user should accept an End User License Agreement (EULA) and if not the user should be denied access to IBM Connections. Users wasn’t allowed to be available in IBM Connections before opting in to using it by accepting the EULA i.e. they didn’t want users in the Profiles database before they had accepted the EULA. The access procedure they wanted may be illustrated as below. So what does an IBM Business Partner do? Say “Sorry that isn’t possible” and “That’s really not the way that IBM Connections work”? Well of course not because it was and is possible due to IBM Connections being built on top of Websphere Application Server which is an open and highly extensible platform. The key piece to the puzzle is a piece of technology called a Trust Association Interceptor – or TAI for short – and is a way to change the way Websphere handles authentication and how Websphere normally integrates with reverse proxies such as WebSEAL. User tries to access IBM Connections. 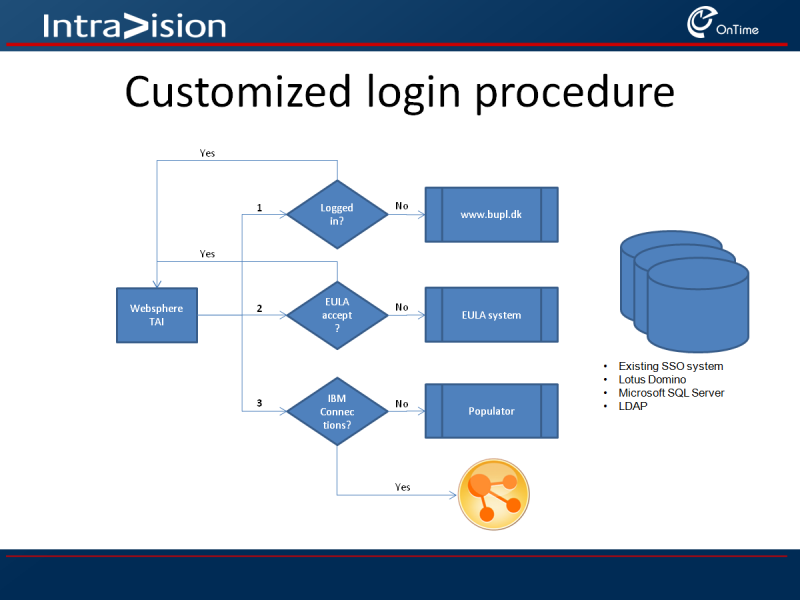 If the user isn’t logged in using the 3rd party SSO solution the user is sent to the login screen (1 in the diagram above). If the user is logged in (and tokens are still valid) an EULA check is performed to verify that the latest EULA has been agreed to. If not the user is sent to the EULA system (2 in the diagram above) to accept the EULA instructing the EULA system to return the user to IBM Connections afterwards. If the user did accept the latest EULA we check to see if the user is available in IBM Connections. If the user isn’t in Profiles yet the user is sent to the Populator system (3 in the diagram above) that handles collecting using information and populating Profiles. Once completed the user is returned to Websphere Application Server. If the user is in Profiles already the user is granted access to IBM Connections (bottom on the diagram). It sounds complex but it’s done in less than 500 lines of code incl. comments and documentation. That isn’t too bad is it? What’s really cool is that it allows for some very exciting ways to integrated IBM Connections into existing environments. I’ll post more about TAI’s over the next few days about how you write them and more about the technical underpinnings. Stay tuned.